This is Me…….. I’m Abbie Searle, also known as Abbieanne. I patchwork and quilt. I paint and I play. I manipulate fabrics and ask you to use your own imagination. I teach and encourage others. I love colour and fabric. I like to laugh. I’m also very nosey… I like to see others’ work, discuss what’s occurring and try new things. I’ve always loved anything to do with art, the bigger, brighter and more tactile the better, although I can appreciate traditional as well. I found patchwork and quilting lots of years ago (!) when I was on an economy mission to make a quilt for a present. I saw one in a shop, didn’t like the colours and decided I could do that…….sooooooooo, that’s when the obsession started! I could fill pages with guff about what I do, but I would prefer it if you look at my work and make up your own minds. I will say that the obsession led me into getting some C&G qualifications in Design, Patchwork and Quilting and Embroidery, these on top of my art qualifications and many years of just messing about in any artistic material or medium I could afford at the time! I’ve won a few art based competitions, I’ve displayed quilts at the Quilts UK show at Malvern and The Festival of Quilts at the NEC, I have also taught at the NEC. I have had projects published by magazines and produce unique patterns for sale. I also work in a fabulous art supplies and crafts shop just down the road from me, it’s like going to play in a sweet shop every day! 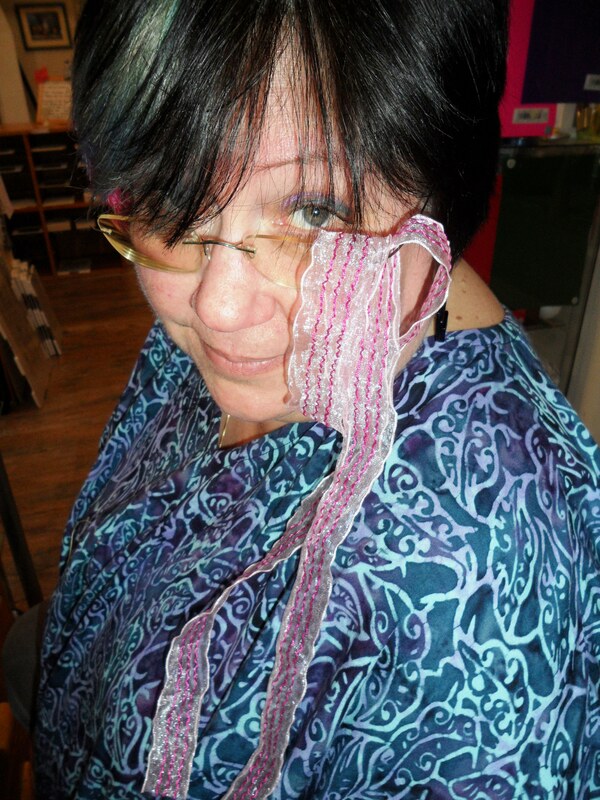 (Artycrafts in Wadebridge, Cornwall…….…) I teach basic & intermediates hand patchwork & quilting classes. I teach requested craft workshops in a range of techniques, not just fabrics. I trundle my quilts, some by me, some not, around to group meetings and stand talking at people about them, local WI’s are getting to know me well! I have a wonderful time meeting people and hopefully inspiring them to do a bit themselves. I take commissions: quilts, wall-hangings, pictures, whatever anybody wants, so long as I can figure out a way to make it, or,: You design it, I’ll make it – for a small fee of course!